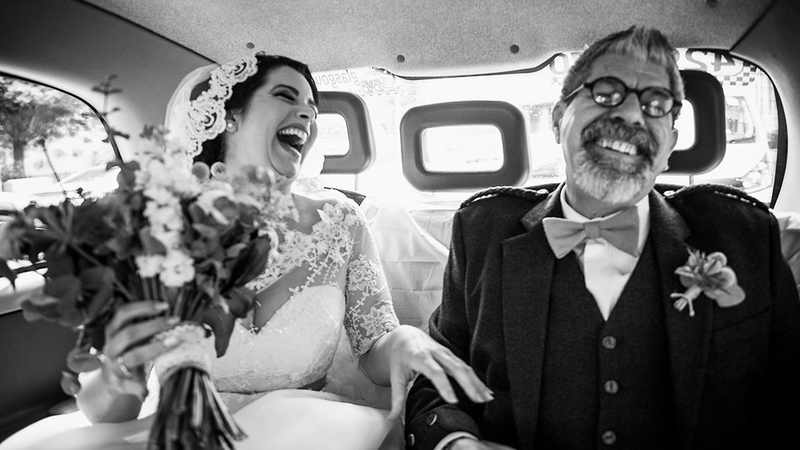 A couple of years ago I set up the Documentary Wedding Photography community on Google+. The community has grown at a steady rate and now has over 2,859+ members and a healthy flow of stimulating observational wedding photography. Every week an image is selected as ‘Photo of the Week’ from the submissions and the previous weekly winner is responsible for making the winning selection, the baton is then passed to the next winner, and so. 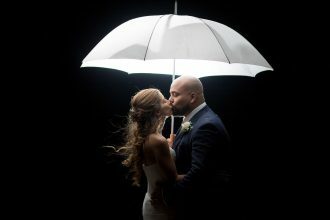 This post is a celebration of 1 year of the community and the outstanding wedding photography that has been posted by the members in 2015. If you would like to share your photography in the future, head over to community and join them. I would like to mention there were 4 additional winners of ‘Photo of the Week’ this year but I was unable to secure their consent to post their photography. There are as follows: Maciej Janowicz, Jackson and Co Photography, Marie Wootton Photography, Haydn Rydings Photography. 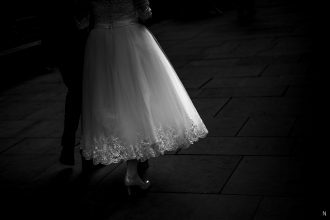 My choice for the documentary wedding photography image of the year goes to York Place Studios and their iconic ‘Snow Bride‘. This image has already been celebrated several times already in 2015 and I’m sure you will agree it’s totally enchanting! 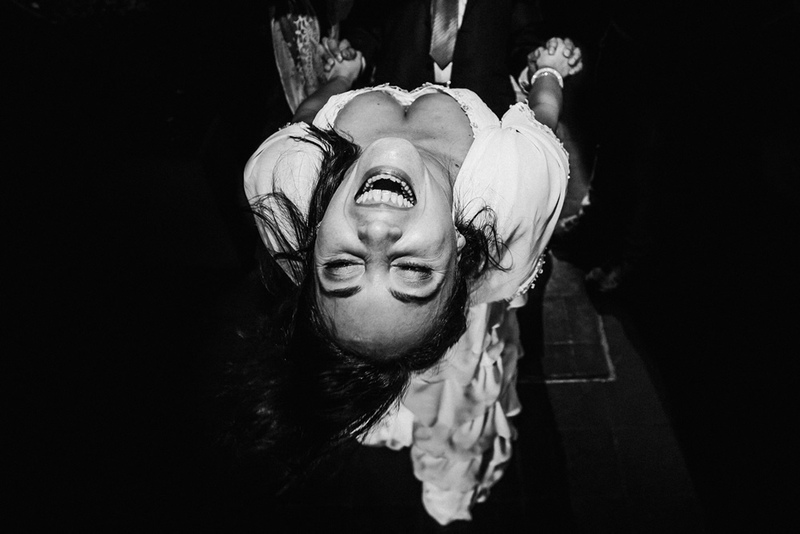 Story behind the image: Sophie & Pete – Highcliffe Castle – Dorset. This is one of those moments that you see happening and glad you were quick enough to take the image. I don’t always get them but I enjoy these surreal images when I’m quick enough! 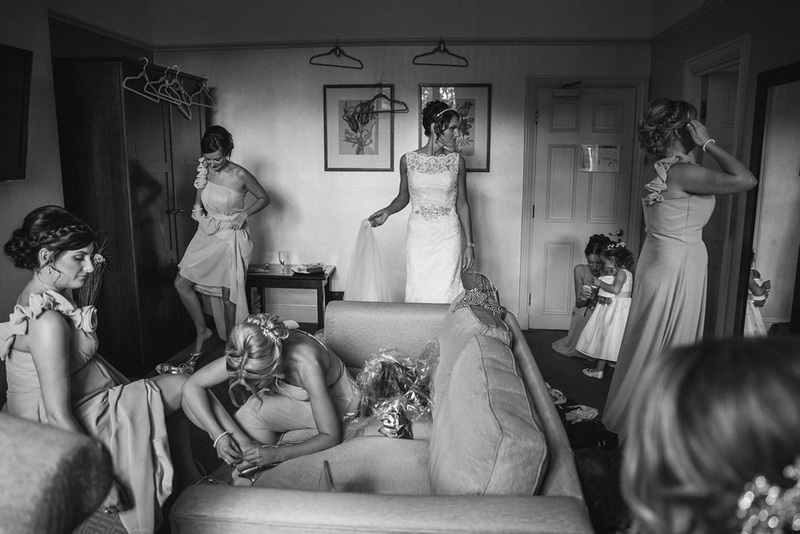 Story behind the image: Bridesmaids – This image was shot at Inglewood Manor in Cheshire. 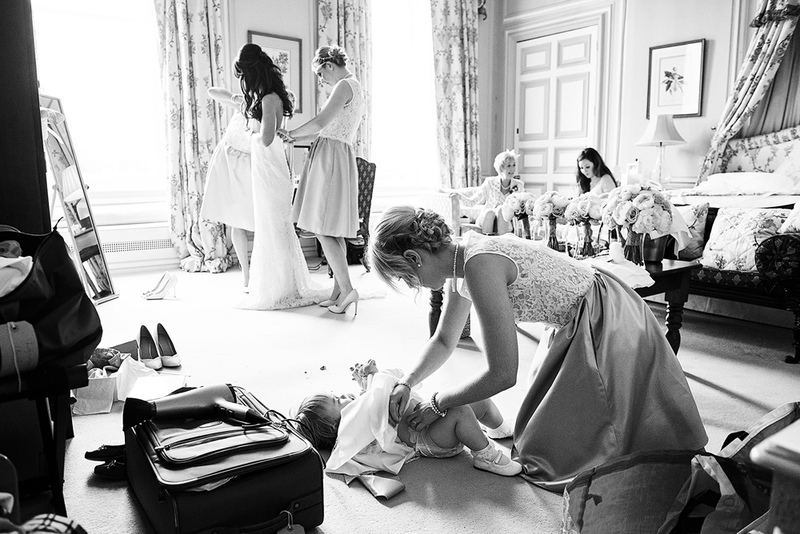 Ghislaine and her bridesmaids were getting ready in one of the rooms upstairs, the run is buzzing with action as all the girls are in the final stages of preparation. This is one of those type of images that you wait for and hope to come together. Story behind the image: I like using reflections such as mirrors or water for a creative effect in my images. This was taken at the brides Mum’s home in Manchester, this is where she was getting ready with her bridesmaids. Story behind the image: The image was taken at Athelhampton House, near Dorchester, Dorset. A beautiful 15th century private home steeped in history. The image was one of those priceless moments that I didn’t see coming – always the best to capture. I had moved from the front of venue to the back for an alternative angle when the couple were exchanging their vows. 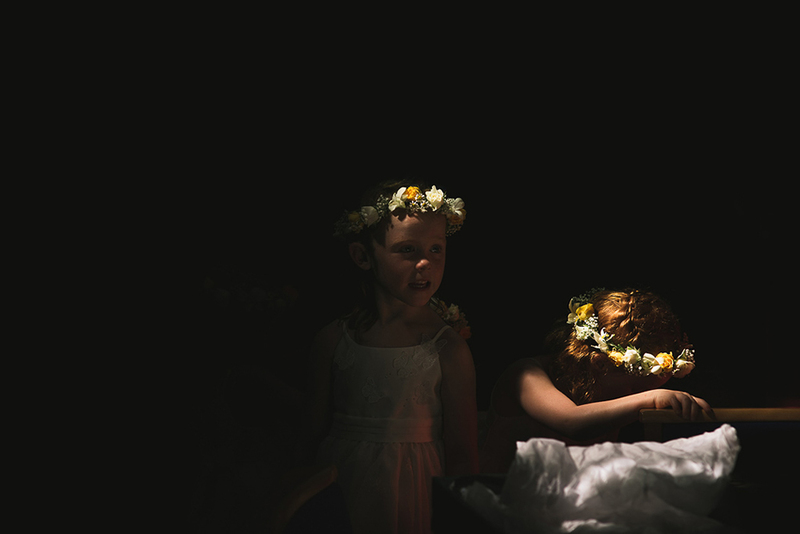 I think the bridesmaids and close family were shedding a few tears, to which one of the flower girls decided to pass a tissue across the aisle. 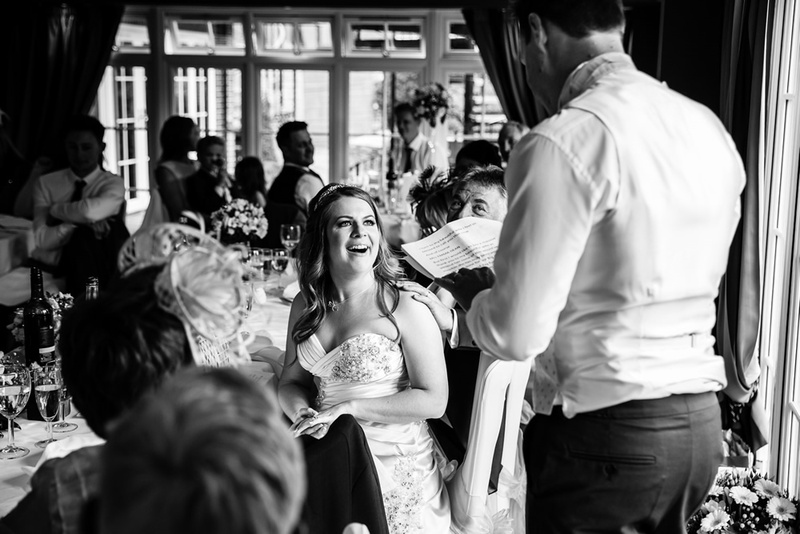 This simple exchange added a fresh, alternative presentation to the ‘straight’ vows change / wedding service type shot, capturing the emotional context of the day. One of my favourite images from recent years. 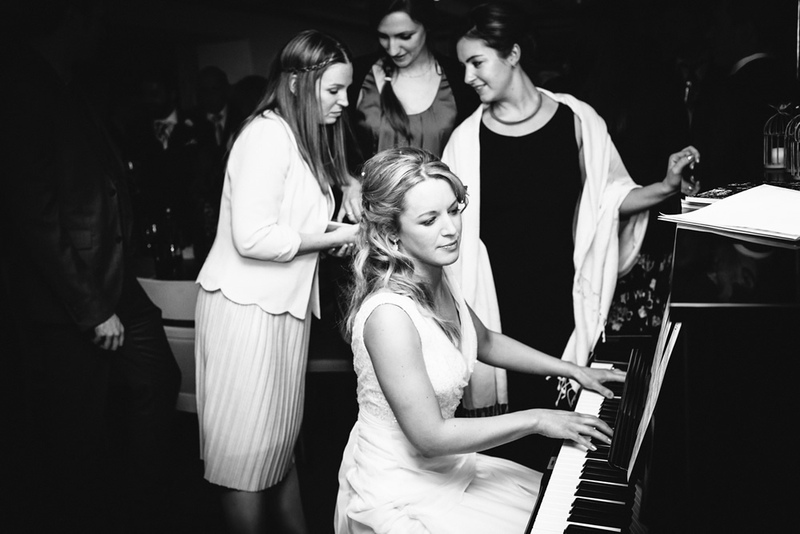 Story behind the image: Taken at Mottram Hall in Cheshire, UK. I’m predominantly a documentary photographer but whenever I’m asked to do more formal group shots I try and capture them in as relaxed a manor as possible. 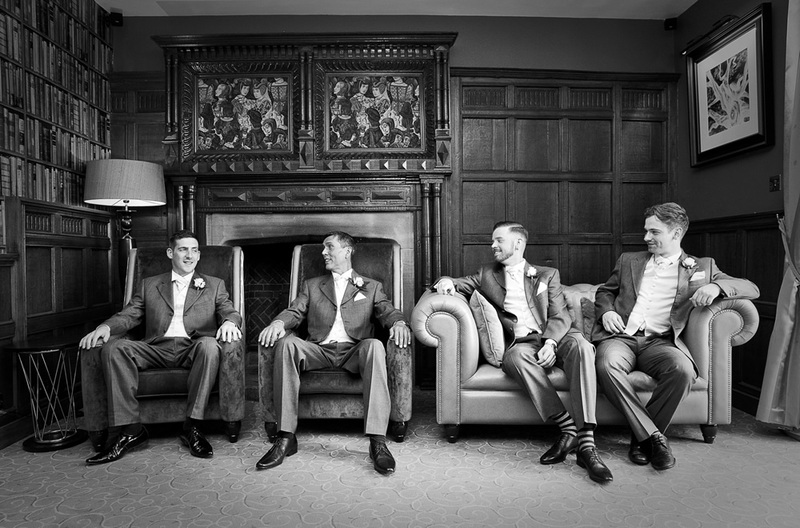 This image is of the groom with his groomsmen relaxing just before the ceremony, they were all sat down in a row chatting away so I took a few shots without them noticing. 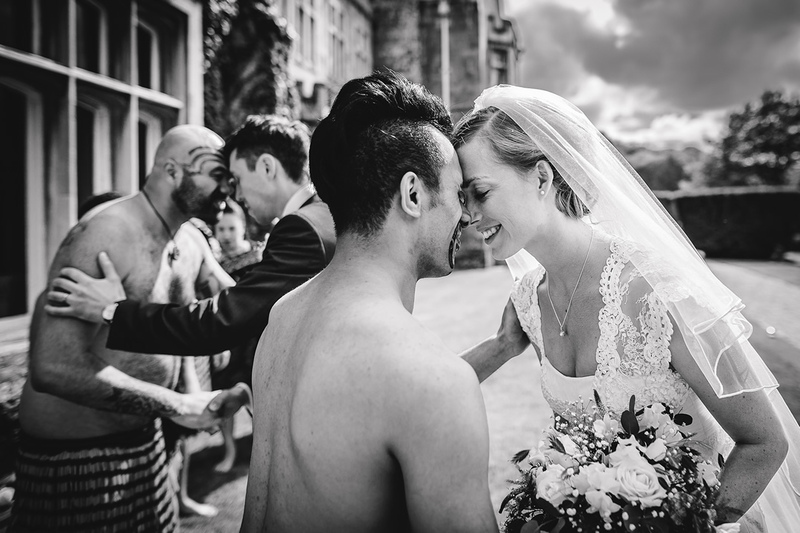 Story behind the image: This was taken at Angela & Gary’s wedding at Culcreuch Castle in Fintry, Scotland. 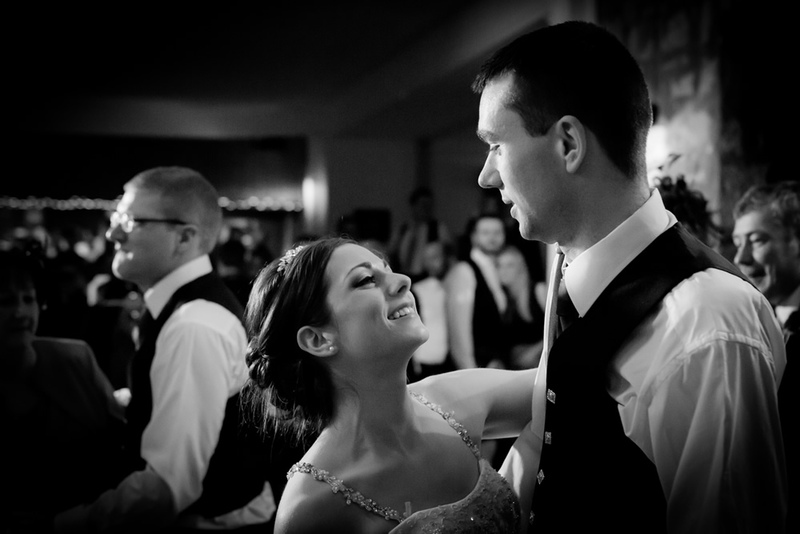 After the tension of the first dance, the party starts and this young couple ease into their fun mode. Story behind the image: Taken at Sale Town Hall, Manchester, UK. 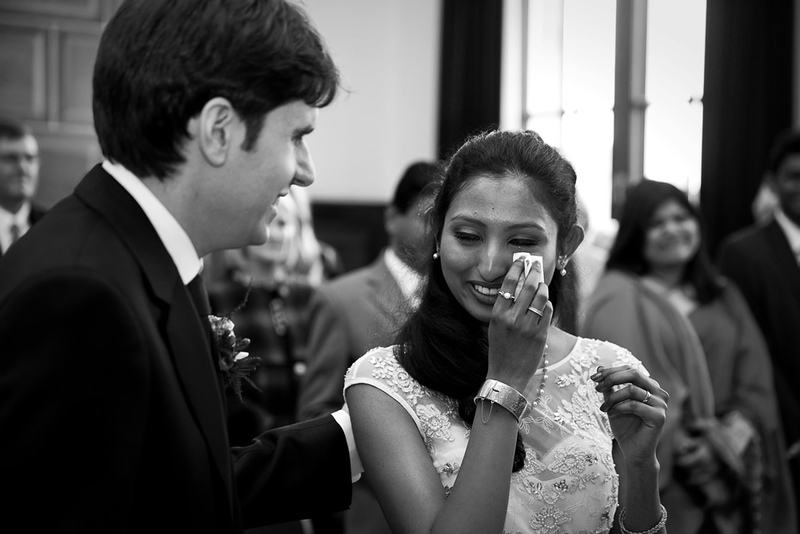 This was a mixed culture wedding with the groom originally from South Africa and the bride from India. Both families were in attendance and it was a very emotional ceremony as you can see from this shot of the bride shedding a tear. 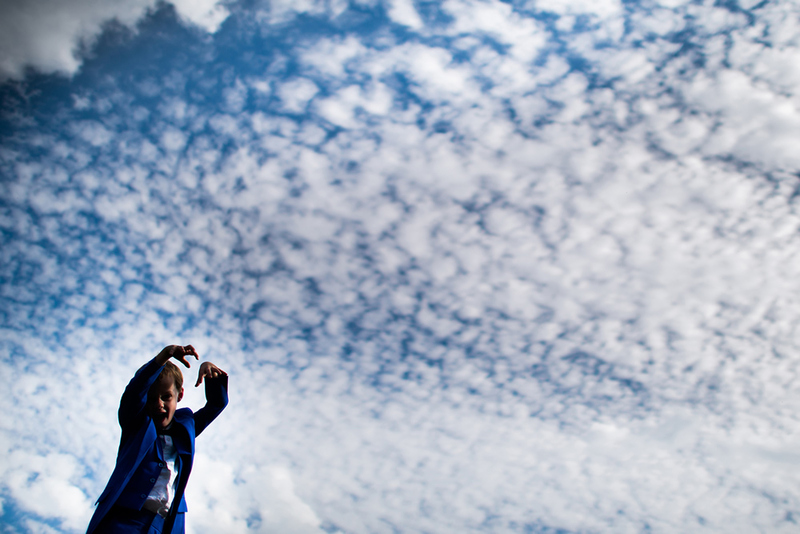 Story behind the image: Jennifer & Jamie – North Cadbury Court – Somerset. I love this image simply because of the fact that you can see how important and emotional it is for Jennifer to read the words from her future husband, It was great to photograph those emotions. I love the way the tear catches the light, the black and white definitely makes the image. Story behind the image: This photo was taken at Kelham House in Nottinghamshire. 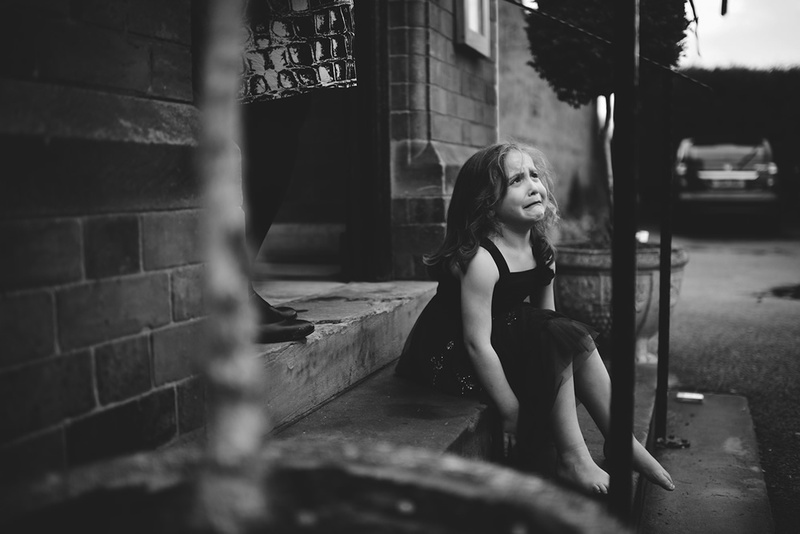 There were quite a few kids present at this wedding and they all had such a great fun. Sometimes falling over and being hurt is part of the play. She was soon back in the game. 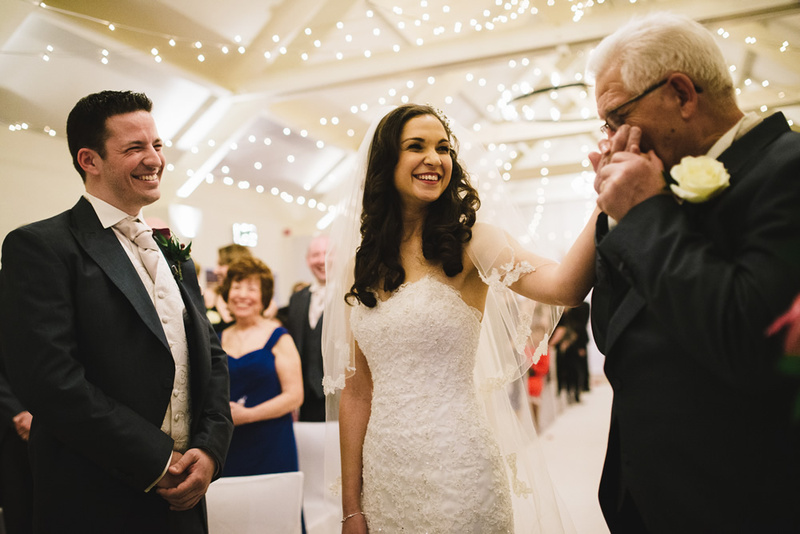 Story behind the image: A deeply emotional father and daughter moment at a wonderful Brighton wedding. Story behind the image: The snow bride is one of our most popular photographs of 2015. 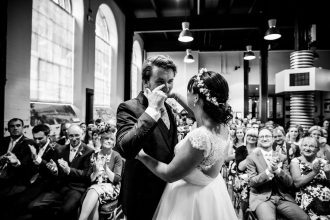 Winning first place in the wedding category of this year’s International Rangefinder Photography Annual, it has been a firm favourite with couples and peers alike and one of our personal favourites too! The frame was taken at Broughton Hall outside a snow covered teepee – our Australian bride ran outside when it started snowing and we quickly followed. 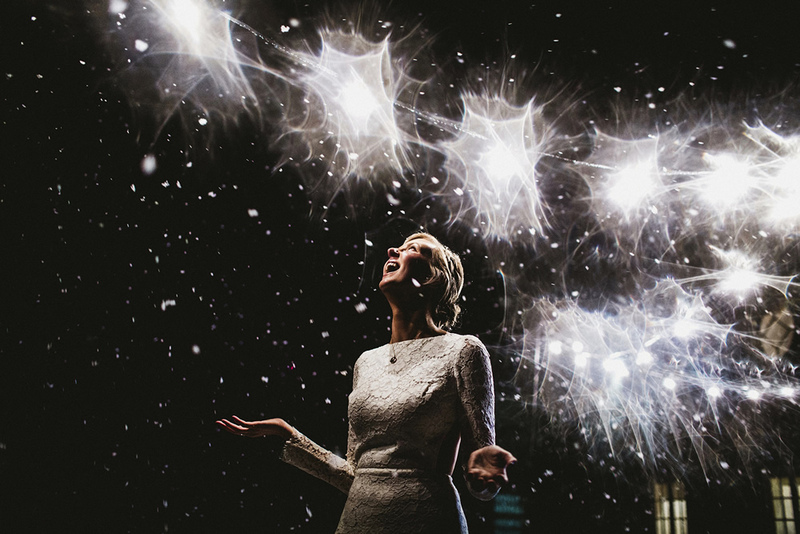 This frame captures the moment when she lifted her hands up in pure excitement to touch the snow – after living in Australia for so long it was her dream to have snow on her wedding day! 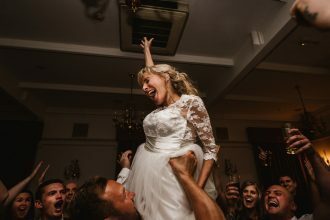 Story behind the image: If you were to ask me one of the things I love about photography, it’s expecting the unexpected, and having been a photographer at well over 100 weddings this was certainly unexpected! 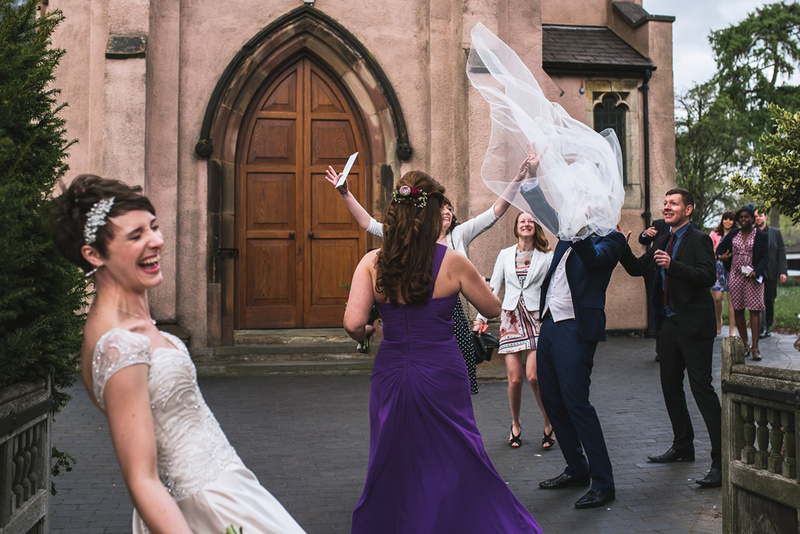 I absolutely love everything about this picture – from Lucy’s expression to the fact that her veil managed to ‘attack’ the guy she’s just married! Definitely one of my all-time favourites. 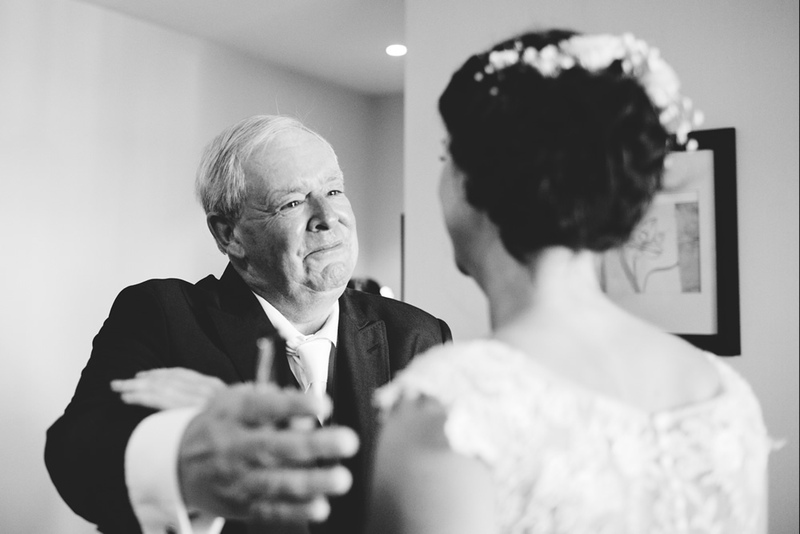 Story behind the image: Emotional groom sheds a tear and is comforted by his dad (who was also his best man for the day) as his smiling bride approaches with her father. Shot at Old Thorns in the Hampshire Suite. Love this image as it has so much going on and is full of emotion. When I was editing it, I also realised it had the page boy, bottom right in the picture too, who was their favourite nephew. 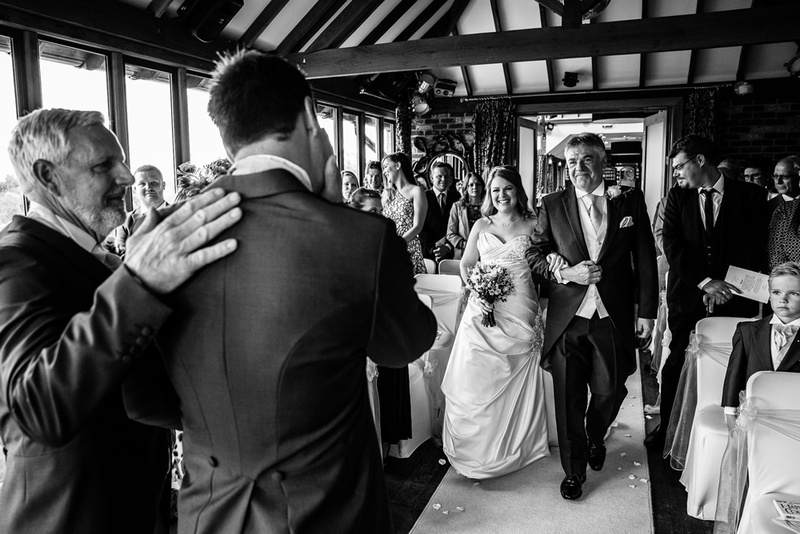 Add to that a bride, both fathers and quite a few guests – it’s a great shot. 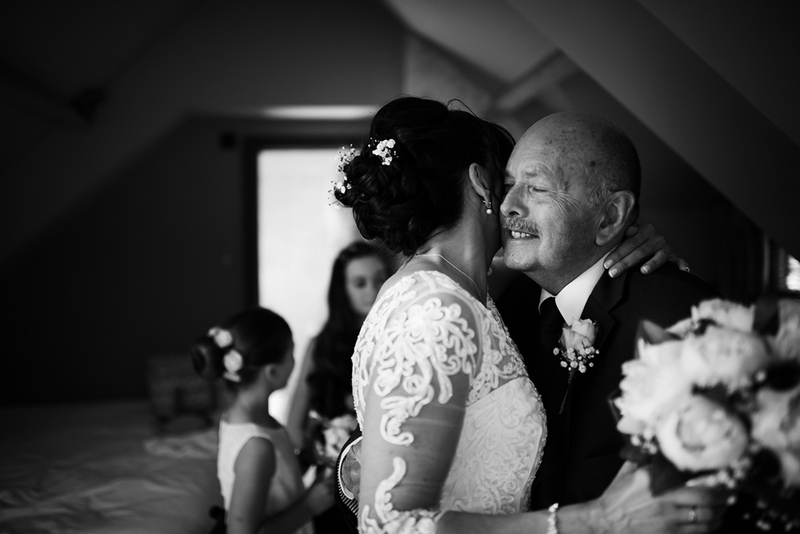 Story behind the image: Father and the bride shared the very special moment just before the ceremony. The image shows strong connection between them. It happened in a perfect spot. There was no natural light source in the room other than a small window to the left. I took this shot at Chequers Inn, a Nottinghamshire wedding venue near the Belvoir Castle. Story behind the image: The Grooms Speech. 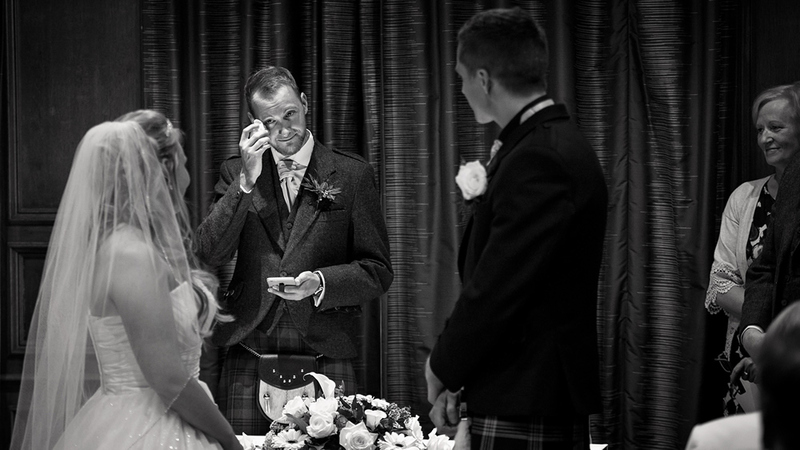 Another very emotional moment from this wedding. It really was a lovely wedding to shoot. Shot in the Hampshire Suite at Old Thorns Manor Hotel in Hampshire. I love the image firstly because of the light – that’s really what makes the bride stand out, perfect window light on her face surrounded by a darker background. Her face is totally in the moment, fully animated with a huge smile. The little extras of her touching her wedding ring and the fathers hand on her shoulder are just icing on the cake. Story behind the image: This is a little detail shot from Kim and Alex’s wedding back in March 2015, this was taken at Ramster Hall in Chiddingfold, Surrey. The image is a documentary style photograph in that nothing was moved or interrupted just pure observation. I had noticed that Alex was chatting to a few friends whilst sub consciously adjusting to the freshly placed wedding band around his finger, I shot a couple of frames and prefer this image as the ring was obstructed in the previous frame. 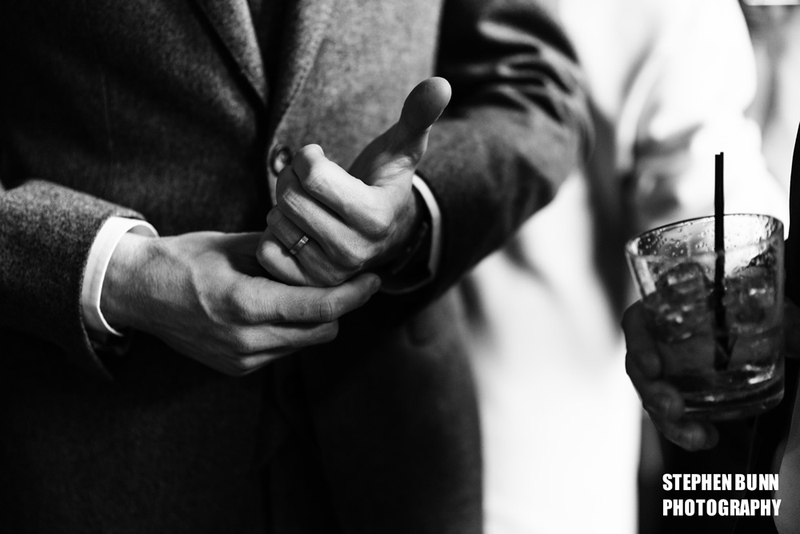 Simple subtle details really add punch to a complete story when documenting a wedding day. Story behind the image: Last year was the first time shooting at the Turner Contemporary in Margate, and one of the things I loved was the interior decor – all white walls and clean lines – making it perfect for minimalistic photography. So you can imagine how thrilled I was when I saw the above scene in front of me! One of my favourites from any year. 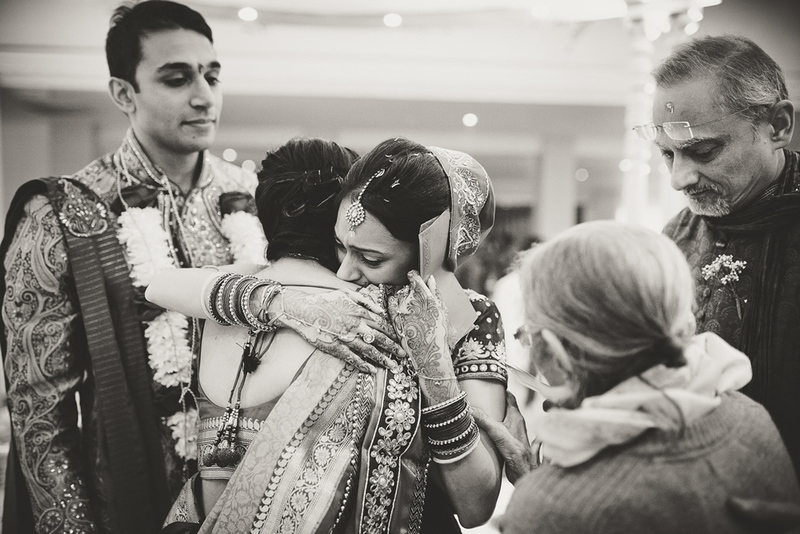 Story behind the image: I haven’t photographed many Indian weddings – in fact, this was only my second in 5 years – but something which I found so moving was all the outpouring of emotion on the day. This moment came near the end of the ceremony, as Jesal thanked her mother for her wedding gift, whilst being surrounded by her newly anointed husband, and father and grandmother. Why do I like this image? 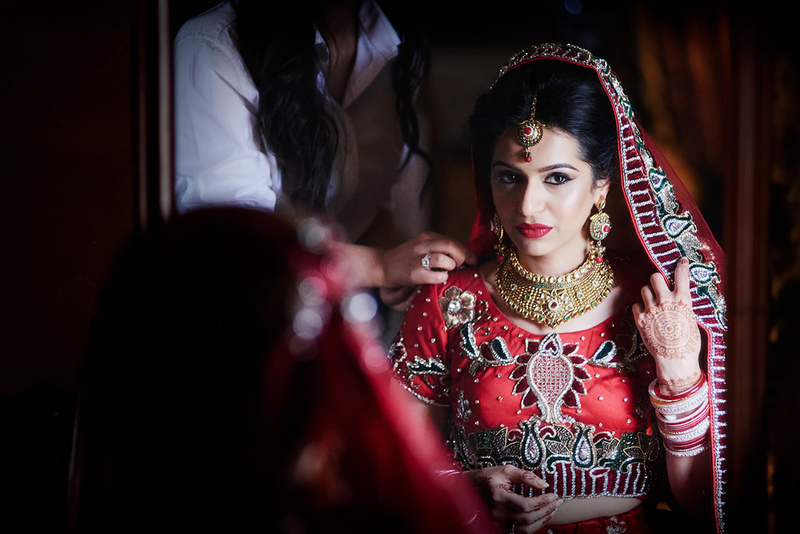 The beautiful light, the vibrant colour, the beautiful bride and her calm look while her make-up artist puts the finishing touches to the costume. She’s in her own little bubble, while chaos is going on all around her in the room. It doesn’t look like it, but it’s a totally unposed shot, as all of mine are. Story behind the image: Kim & Dave – Seymours Court Farm in Beckington, Somerset. Quite a lot of the marquees I photograph are all white which is fine, I noticed that part of the stage marquee was jet black and had tested some images out on guest an hour before the dance between Kim and her father. 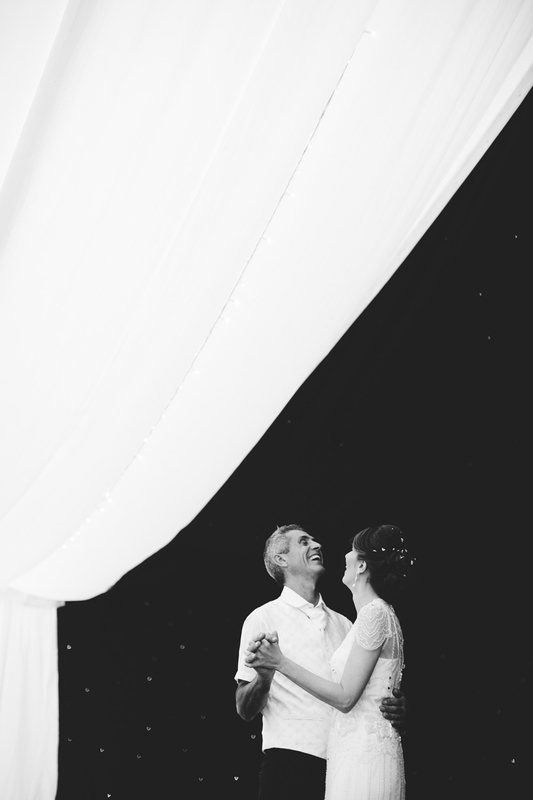 It was a special moment which is really helped by the contrast and framing of the marque to the two of them dancing. Story behind the image: I love storytelling images. It is one of my favourite shots I have taken last season. I framed this moment during the signing of the register. 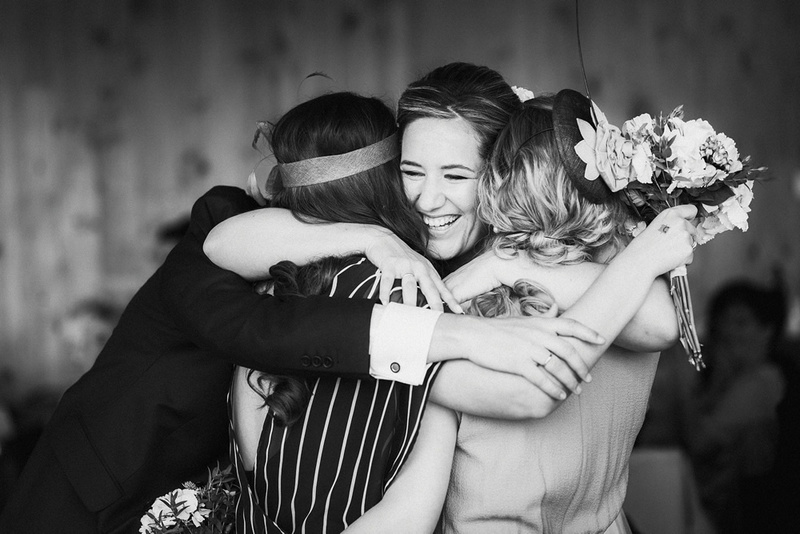 Lucy and Stef’s wedding was full of emotions, joy, happiness. They got married at St. John’s Church in Perlethorpe with reception at Thoresby Riding Hall. Story behind the image: This image was taken at Espacio Gastronómico del Chef Guillermo Rodríguez, in the comune of Ñuñoa, Santiago, Chile. That was the first time I registered a surprise wedding… Yes, you read it correctly… That was a surprise wedding! All the guests that were invited thought they have been invited to the bride’s birthday. The bride and the groom planned their wedding secretly because they did not want their wedding to be a conventional one so the day of the wedding was the day of the bride’s birthday. 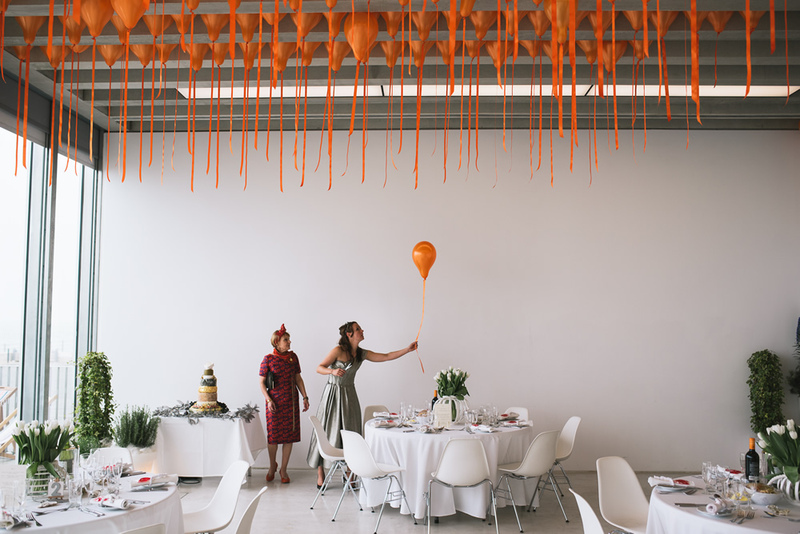 They invited their close friends and family to a birthday party to give them a big surprise. Espacio Gastronómico is a very warm place with beautiful rooms and a very nice illumination. The image of the bride is a résumé of that magical moment full of happiness. Story behind the image: After a very emotional reception to the couples wedding Haka I was hoping for moment like this and nearly fell over myself in the rush to capture it when it happened. It was a powerful moment and the atmosphere was truly electric. 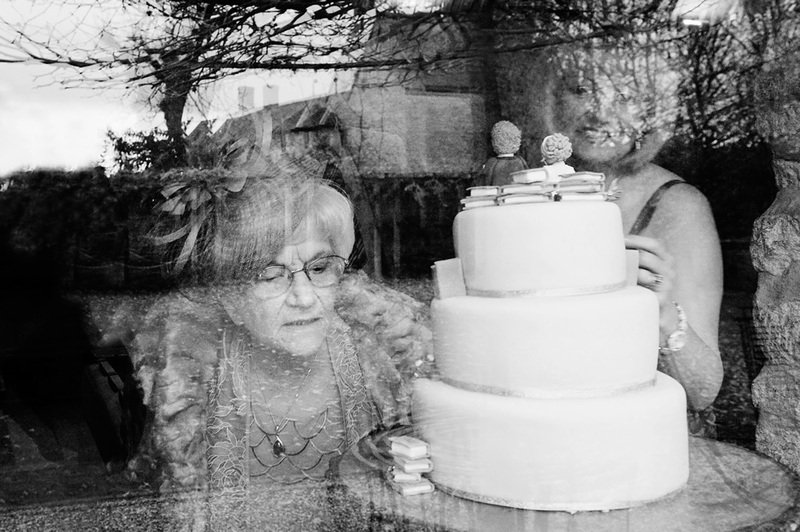 Story behind the image: This was taken at a winter wedding where the grandmother was inspecting the bride’s handiwork (a cake maker) and I love it for the concentration on the grandmother’s face. 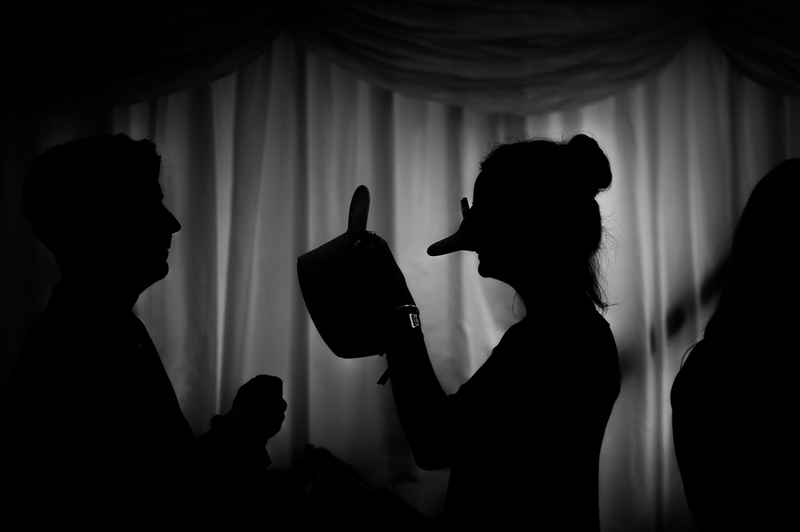 Story behind the image: This image is from Rich and Emily’s marquee wedding at The Old Hall in Groby, Leicestershire. I love this picture and its quirkiness. Lighting conditions were perfect for a silhouette and I just had to wait for a right moment to unfold. Story behind the image: One of the perks of getting married in Apex Hotel on Waterloo Place is the light in the ceremony room. It’s an amazing addition to all the emotions during the ceremony. Here’s bride’s brother giving the so emotional speech during the service. 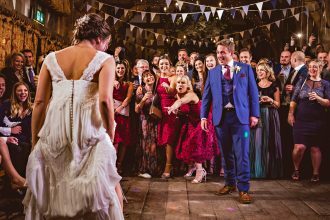 Story behind the image: We at York Place Studios love a crazy dance floor and this wedding had a particularly bonkers one! 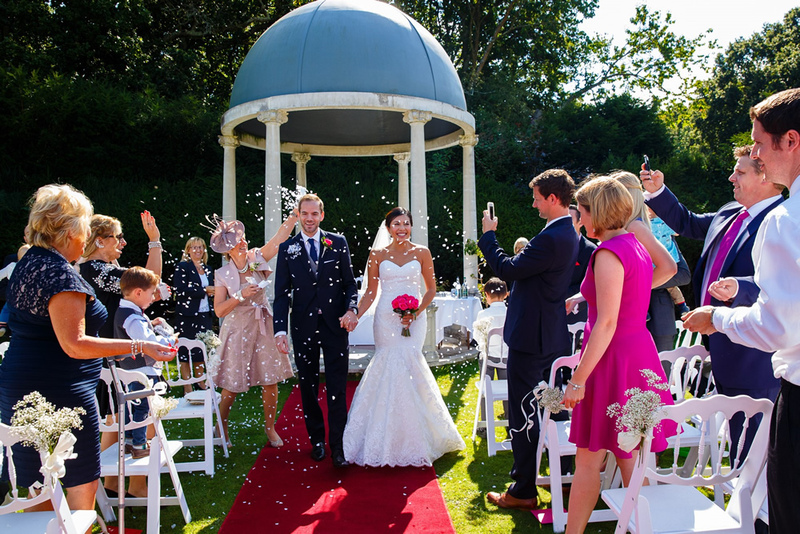 The wedding took place at Dukes Place Courtyard in Harrogate on a summers day in one of our favourite wedding settings – a teepee! 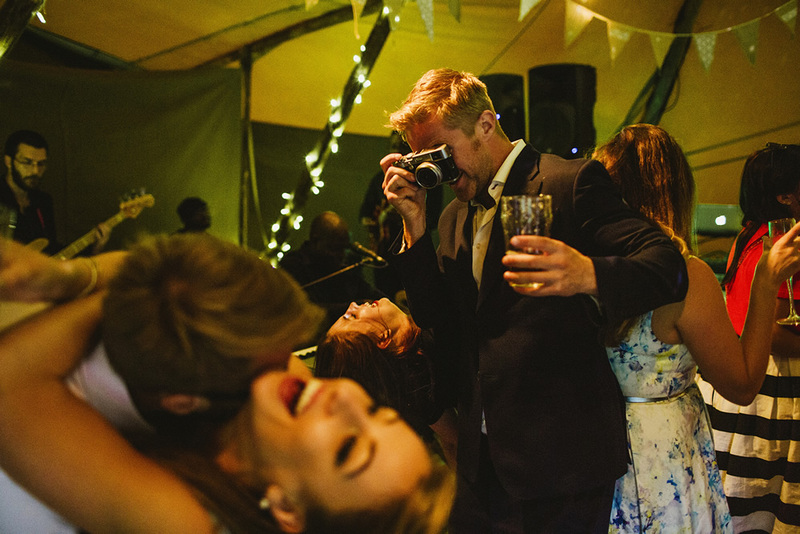 We are always searching the dance floor for those perfect layered moments so when one of the guys started taking a photo whilst simultaneously two girls threw their heads back in perfect symmetry we knew we had a cracking shot! To see the full post follow the link below. Story behind the image: I’d just finished documenting the boys arriving and fixing button holes. Went back up to the bride’s room to record the dress being out on and got greeted by her sister and niece in the midst of a nappy change. I love the layering in this shot, three layers with individual stories in each. 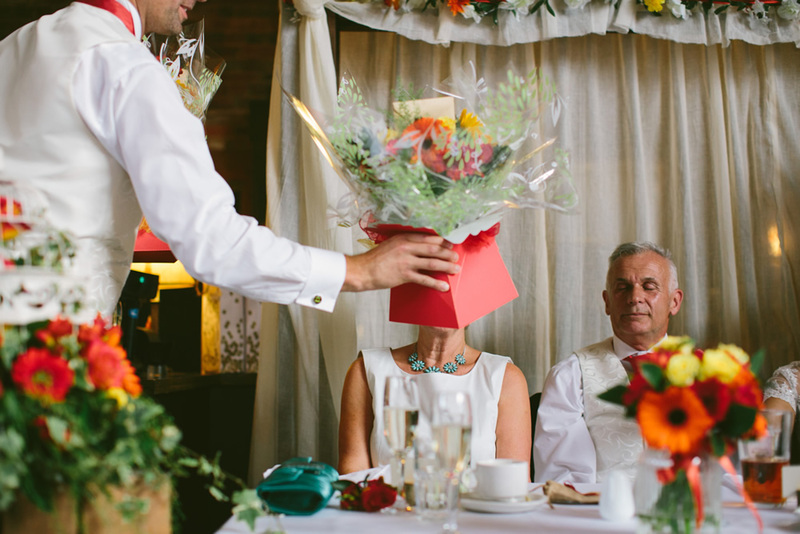 Story behind the image: Tiffany & Chris – Old Greens Barn – Surrey. I knew Tiffany’s dad would come in from the far door so I positioned myself just behind the bride. You never know what type of reaction you will get from fathers but sometimes they are awesome. He was truly over the moon and it made for some really emotional photographs. 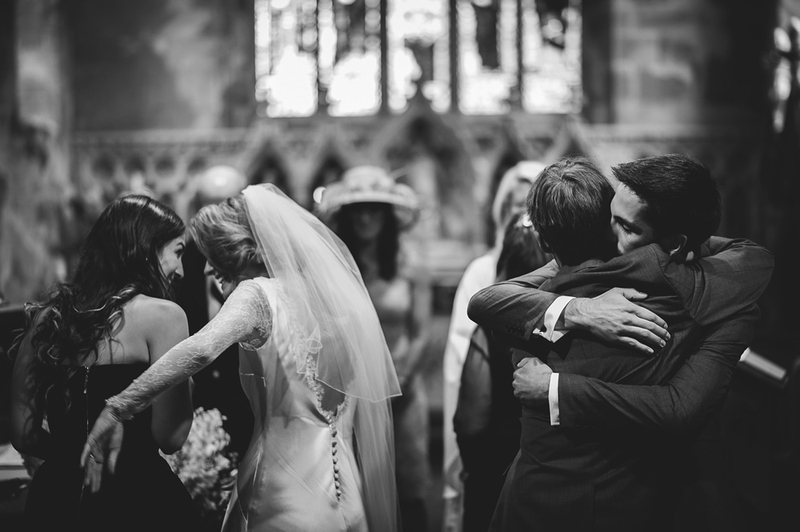 Story behind the image: Robbie and Helen’s wedding took place at Holy Cross Church in Epperstone with reception at Hodsock Priory near Worksop, Nottinghamshire. Dad and the bride special moment was captured just before they entered for the ceremony. No need for words here, the way they look at each other says everything about their strong bond. 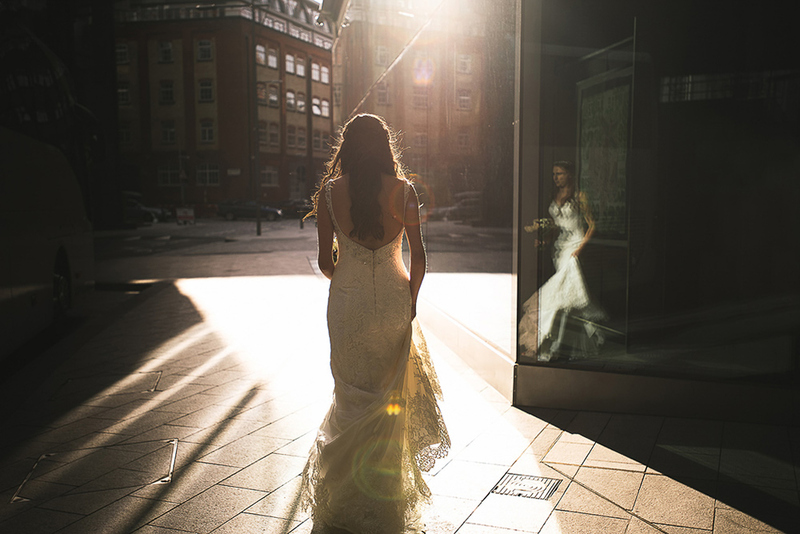 Story behind the image: Jordana, on her way to her First Look. Story behind the image: This lad was playing some imaginary game on his own. I didn’t want anything or anyone within the picture, just him and his world. Framing wasn’t easy. I had to position myself quite low to eliminate all unwanted elements from the photo. It was taken during outdoor speeches at Dan and Kelly-Anne’s wedding. They got married at Newstead Abbey near Nottingham. Story behind the image: Back shot of Bride standing in Window. 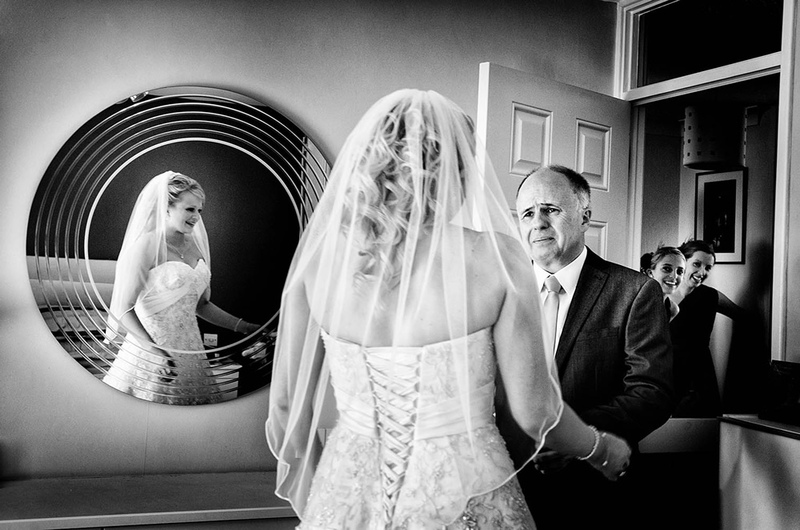 Another wedding shot in one of the bridal suites at Old Thorns Manor Hotel, Hampshire. 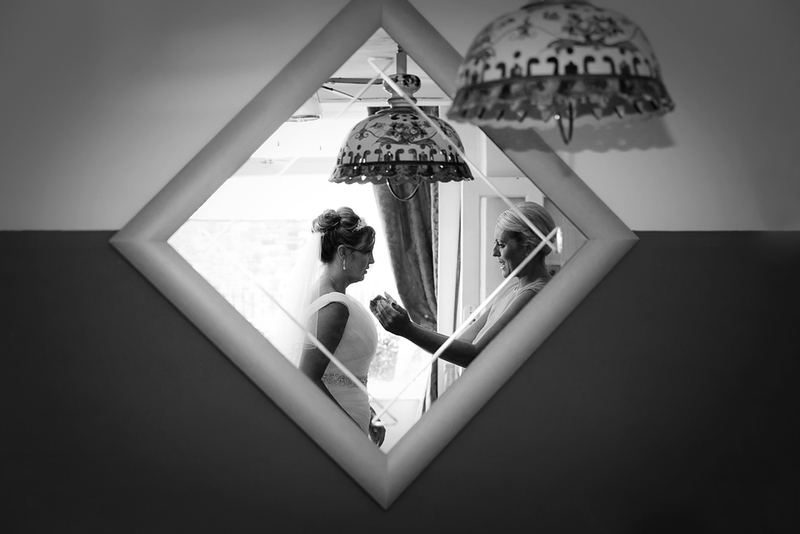 The bride had just put on her dress and went over to the window to check her makeup in the small mirror. 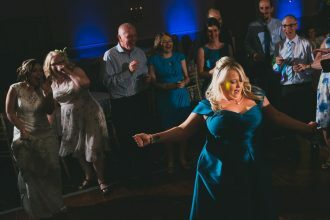 There was no posing involved as always, as a documentary wedding photographer my job is simply to observe what happens and when something fabulous happens, I try and get a great image from it. She was totally unaware that I was shooting this picture. Funnily for a photographer, the spotlight above her which give off a horrible light during preps actually worked in my favour for this image, giving a great light on the details of the dress. Story behind the image: Wenshuo & Laurence during their portrait session at Leeds Castle in Kent. Although I am mostly a documentary wedding photographer, I do take the couples away for a few portraits on their wedding day. I am always drawn to the moments in between portraits, a touch, motion, suggestion, or maybe a gentle breeze through the bride’s hair can all add a touch of life to a photograph. 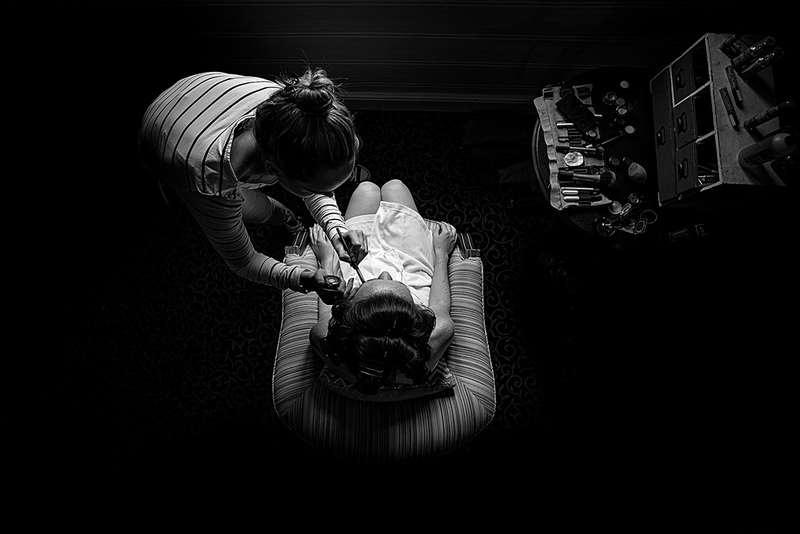 Story behind the image: This image was captured during the bridal preparations for Lisa & Richard’s wedding at the Coed-Y-Mwstwr Hotel in Bridgend, South Wales. I’m always looking for an alternative perspective for my images and having read where the light was falling I saw an opportunity and grabbed it by balancing behind and above Lisa on a wobbly chair. 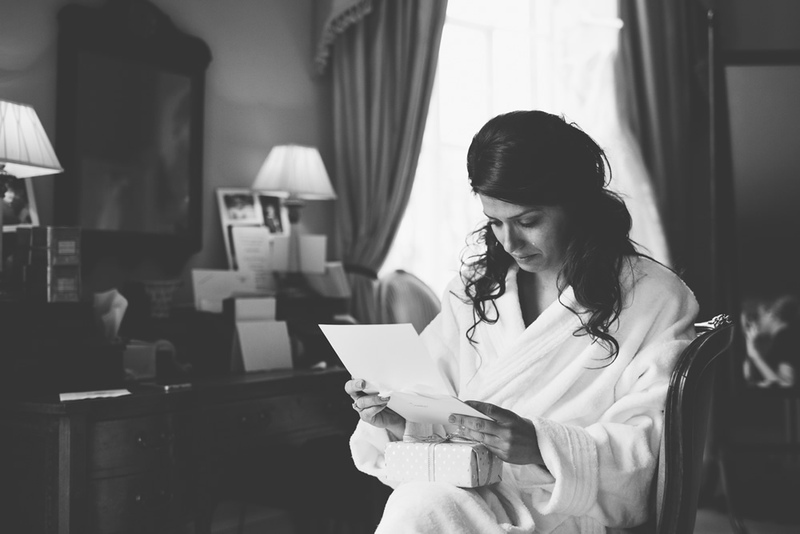 I love covering the bridal preparations and this image is very memorable to me as it reflects how calm Lisa was at the time. Shortly before the giggles, the tears and champagne started to flow. 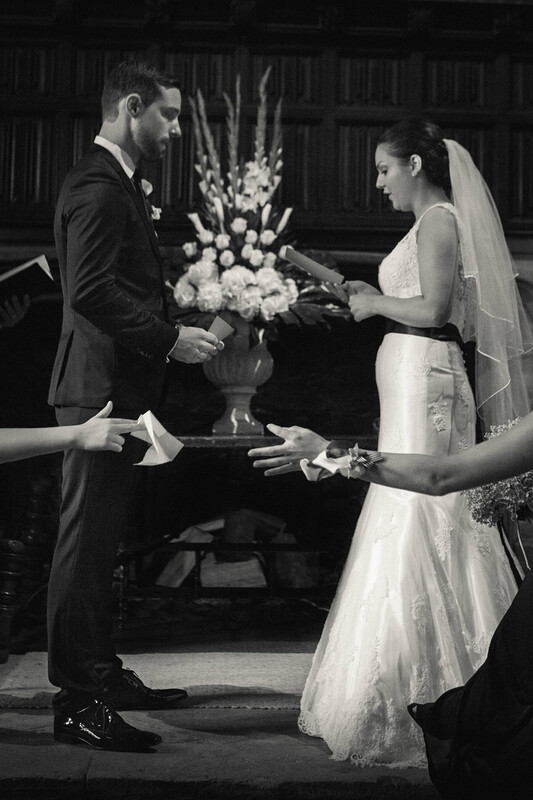 Story behind the image: Bride and Groom walking down the aisle while the guests throw confetti on them. Shot at Rhinefield House Hotel. This was a small intimate family wedding, shot outdoors at Rhinefield on a glorious late summer day. I love the fact that it shows the lovely Doric Temple where they’ve just got married, lots of happy faces of the guests, lovely backlight, showing what a sunny day it was. It’s a great shot to sum up the wedding day in one image. 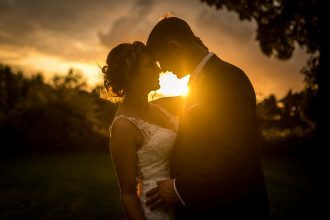 This wedding photography website is exclusively for UK wedding photographers to profile their wedding photography, shot at venues and locations from across the United Kingdom. It is designed to be powered by the photographers themselves via authorship. Each having a personal author page, profiling the weddings and contribution they have made to this website. 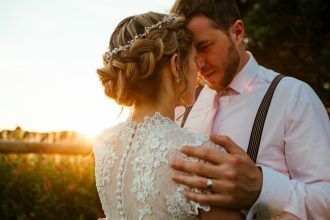 We welcome submissions from weddings already featured on your own websites and we will link to the original posts for you! My objectives are to help professional photographers with every aspect of their online presence, increasing the visibility and reach of their business, culminating in increased lead generation and enquiries, resulting in more conversions, propagating new untapped referral networks. Amazing collection of photographs! Congratulations! Great photos, Congratulations to everyone !! !